The Broil King Imperial XLS features two totally independent ovens with a total of 1000 square inches of cooking space and includes six stainless steel Dual-Tube burners, professional cast stainless steel cooking grids, stainless steel Flav-R-Wave cooking system, built-in oven and control knob lights, two electronic igniters. The XLS features stainless steel side shelves with right side storage drawer and an enclosed cabinet base with two utility drawers. Cooking Grid Dimensions 37 15/16 X 19 1/4"
Broil King offers a limited lifetime warranty on the cookbox (which includes lid, control panel & housing). The stainless steel Dual-Tube burners and rear rotisserie burner are warranted against defects in materials and workmanship for ten (10) years. The stainless steel Flav-R-Wave cooking system and stainless steel cart components are warranted for five (5) years. All remaining parts and paint are warranted for two (2) years. This is a great grill. We are so happy we purchased it. We cook outside year around every day. This grill makes this pleasure to cook the meal. If you could put some type of screening on the bottom and back to make it mouse proof that would be helpful for the out side patio cooking. The cast stainless steel cooking grids are just amazing! I also love the full length reat burner. It's an expensive BBQ but It is turning out to be the best one I've owned by far. HAVE HAD GRILL FOR A FEW MONTHS NOW.GRILLING IS WONDERFUL.FROM BEEF TENDERLOIN TO HOT DOGS,IT IS GREAT TO USE.ROTISSERIE IS A GREAT FEATURE.MEATS AND CHICKEN COME OUT TENDER AND JUICY.GREAT PURCHASE. I bought this unit over 2 months ago and I am very pleased. Amazing BBQ, very pleased with the quality nonetheless it has to pass the time trial. I previously owned only Napoleon and was very disappointed by the material quality of some parts that were completely rusted after only 2 years. This one was purchased as Brault & Martineau, the Brossard CQ store and the delivery experience was awful. Ease in all controls , perfect flame control. I am so glad that I chose Broil King's Imperial 490 for many reasons. From the quality build and solid parts to the ease of operation and cooking performance, this barbecue by far outperforms my previous one. For anyone in the market for a new barbecue with many great features, the Imperial 490 is at the top of the ratings. I would definitely recommend it. Wish I would have purchased sooner! I purchased the Imperial 490 just before Christmas 2016, I've been looking for a new BBQ for about 4 years. I found a great retailer in Grande Prairie, they were very helpful & had a great display. The Imperial 490 has everything I want in a BBQ but not so massive that it was intimidating to use, the lid isn't too heavy and I have all the options I wanted. Again I wish I would have purchased it sooner. 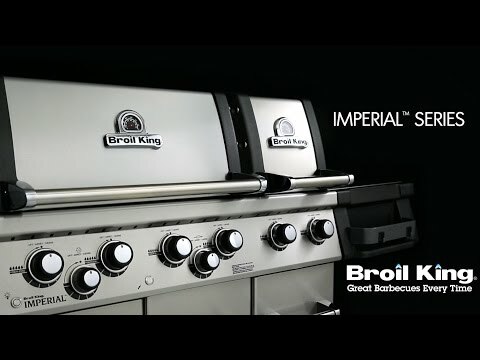 Broil King's Regal and Imperial Series Gas Grills are top of the line for Broil King, especially the Imperial. They are a great value and are loaded with many great features. Some of my favorites include: control knob lights that are great for night time entertaining, storage shelves inside the cart, tool hooks with side shelf bins, and pull out tank drawers for the propane models. The Imperial Series also feature a pull out drawer in the side shelves, as well as interior oven lights. I really like the Stainless Steel Dual Tube Burners. This Dual Tube design creates an efficient double row of flame, powered by a high BTU, which results in solid, high heat output. The Regal Series comes in 4, 5, and 6 burner configurations, and the Imperial Series comes in 5 and 6 burner configurations. The Regal and Imperial Series also feature the Broil King Stainless Steel Flav-R-Wave flame tamers which are great. Above the Flav-R-Wave's, I love the heavy gauge, 9mm Stainless Steel thick and durable cooking grids found on the Regal Series. The Imperial Series cooking grids are even better and tougher, made of reversible Cast Stainless Steel. These reversible grids create steakhouse sear marks on one side, and the other side is grooved to capture juices for continuous basting. I love that these grills come with a side burner and rotisserie. The side burner is perfect for creating mouth-watering side dishes, soups, or sauces while you grill. The powerful 15,000 BTU Stainless Steel Rotisserie Burner comes complete with a premium spit rod and motor, which delivers consistent even heat for excellent cooking results. The side burner isn't available on the Regal S420, and the rear burner isn't available on the Regal S420 & S440. From a durability perspective I like the Stainless Steel Cook box with cast aluminum end caps, backed by a limited lifetime warranty. The Regal XLS and the Imperial XLS feature two independent stainless steel cook boxes that offer the ability to sear in one oven, while cooking at different temperatures in the other oven. While the limited lifetime warranty on the cook box is great, the warranty on the remaining grill components is lower than several other competitors. Also note there is no ceramic infrared sear burner available. You want an American made grill, loaded with features, at a good price. 37 15/16 X 19 1/4" 37 X 18" 37 X 18" 37 1/2 X 19 1/4"